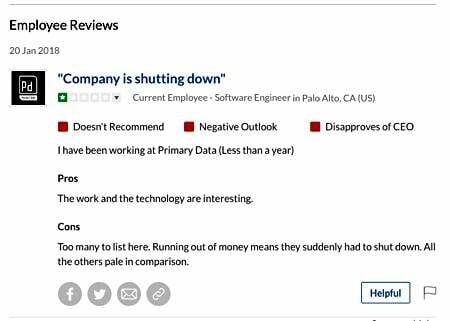 Primary Data, the storage startup offering a metadata-driven abstraction layer, appears to have gone TITSUP – a Total Inability To Sell Us Products. An anonymous source also told us: "Primary Data collapsed and got shut down over the weekend. All employees got laid off. Management wanted to buy off all investors and convert preferred shares to common. Investors said no. $100m of investor money is all burnt up and gone, with nothing to show." A second source said on Saturday that friends at the company had been told the game was up, and emergency funding was being sought. A third confidential informant in the industry also said over the weekend something was certainly going on, and that Primary Data people had said they were not permitted to talk about it. We tried to contact the biz over the weekend and again today, but have not received a reply. Calls to its California and Utah offices go straight to voicemail. A senior partner at its PR agency, Connect Marketing, told us: "Unfortunately, I don’t have any answers for you." They are in the dark, too. TechCrunch has also noted the upstart's apparent demise. David Flynn, who founded Fusion-io, started Primary Data with Fusion-io cofounder Rick White in 2013. Flynn is Primary Data's CTO, White its CMO, and Lance Smith its CEO. Flynn was formerly the president and COO at Fusion-io. Both Fusion and Primary recruited Apple cofounder Steve Wozniak as chief scientist, even though the Woz is not well known as an authority on enterprise storage. Primary Data bagged US$50m in funding in 2013, and another $13m in 2014 in a two-part B-round. Its A-round funding is unknown. Three years later, there was a $20m C-round in August 2017, making $83m of known funding, plus a $20m line of credit. If the C-round and that line of credit have been burned in just four months, that's a very rapid spending rate for a company with about 100 staff. The upstart's product is [was? - ed.] 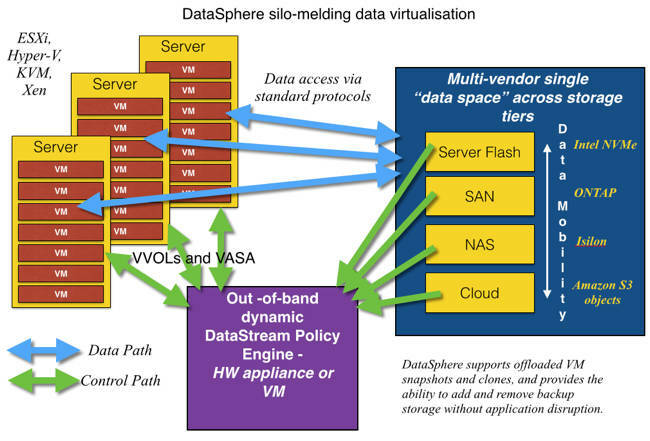 called DataSphere. It offered an out-of-band abstraction access layer across all of a customer's storage – including primary, secondary, nearline, and unstructured data – effectively unifying file, block and object data, allowing storage resources to be optimized and better managed. The claimed benefit to users was more efficient access to and use of stored information, and lower costs. Primary Data was alone in its focus on providing a single access portal to all of a customer's data. Other such data converging portal companies, such as Actifio and Cohesity, focus only on secondary data and things such as better copy data management. The target area for their technology is thus smaller than Primary Data's universal focus. For a startup, selling technology to enterprises that provides control of, and access to, all their data is a huge task. No doubt pilot studies can be run but, at the end if the day, it's hard to ask an enterprise customer to take a huge leap of faith by letting a newcomer handle business-critical information. It appears that too few of them were willing to make such a leap, leaving the upstart unable to find more cash to continue its quest for paying customers.